Could Atlantic Airways Start Flying Between New York & Faroe Islands? I’ve been wanting to visit the Faroe Islands for years (located East of Iceland and North of the UK). I’ve heard it has incredible nature, and it’s not nearly as overrun with tourists as the major hotspots in Iceland. One of the reasons it’s probably not as touristy is because there’s fairly limited air service. Atlantic Airways is the airline of the Faroe Islands, and they’re not nearly as large as Icelandair or WOW Air, for example. Atlantic Airways has a total of three planes, including two A319s and one A320. Historically they’ve operated quite a few seasonal routes, but their big year-round destinations are Bergen, Billund, Copenhagen, and Reykjavik, in addition to summer seasonal flights to some other European destinations. Media in the Faroe Islands is reporting that Atlantic Airways allegedly wants to launch some direct flights between the Faroe Islands and New York in 2019. 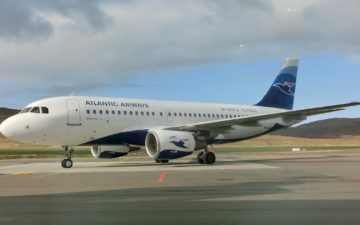 This is according to undisclosed sources, and an Atlantic Airways representative claimed he knew nothing about this, though didn’t deny the rumor either. What do I make of this rumor? Unfortunately I think it’s highly unlikely that this will come to fruition. In fairness, Atlantic Airways is taking delivery of an A320neo next year, which easily has the range to complete the roughly 3,000 mile flight between New York and the Faroe Islands. I think it goes without saying that if this service did happen, it wouldn’t be a daily year-round service, or anything, but rather would be a seasonal flight with limited frequencies. Even so, I just don’t see this happening, given how small their fleet is. It’s one thing if they had a bigger fleet or if they served more destinations in Europe, where they could partly sell tickets using an Icelandair or WOW Air model of selling a stopover, but their route network just isn’t big enough for that. So as much as I’d love to see this happen, I don’t see it happening. That being said, I feel like there is something they could do to make themselves significantly more accessible to Americans. Atlantic Airways flies to Iceland, and it’s just a short 500 mile flight from there to the Faroe Islands. Neither Icelandair nor WOW Air fly to the Faroe Islands. Logically it would make sense for Atlantic Airways to develop some kind of a partnership with one of the two airlines, so they could start selling tickets between the US and Faroe Islands using the most direct routing. Currently the only way to book a ticket from the US to Faroe Islands is to travel through continental Europe, which involves a significant amount of backtracking. The one catch is that Atlantic Airways operates flights to REK, which is the regional airport, while Icelandair and WOW Air operate to KEF, which is the primary international airport. What do you think — is there any way Atlantic Airways will start flights to New York? I really hope not. The Faroes just doesn’t have the tourist infrastructure to support NYC flights. Much of what make the islands unique is the lack of tourists compared to Iceland. Let the Faroes expand their tourist industry organically, not with direct US flights for goodness sakes. Icelandair Groups regional airline, Air Iceland, sells tickets for Atlantic Airways today and services their planes and has done so ever since Icelandair ceased flying to the Faroe Islands. Dan – So the islands can cope with an A320 full of passengers from Bergen, but not from New York? Why do you think American tourists are significantly more demanding than everywhere else? I spent time on the Faroes as part of a Hurtigruten expedition cruise. Gorgeous, but I’d hate to see it over run with tourists…but on the other hand, many people have never even heard of it. I have seen plenty of Americans in Europe that were very cordial and courteous of local styles. I have also seen rude or loud ones. But I have also seen very rude Germans as well as other Europeans. While visiting Nha Trang in Vietnam most tourists were Russian and were extremely inconsiderate and rude. I think it is easy to be critical of poor behavior when observed but we almost never make a mental note of good behavior. Mark Knight – I’ve seen thousands, and the stereotypical ones (thankfully only a minority – presumably the worst are the kind of people who would never set foot outside glorious America) certainly are irritating! Even they however wouldn’t overwhelm the Faroe Islands any more than anyone else would though. Lucky, according to the German website aero.de Atlantic Air says plans to switch (at least partially) to KEF for their Iceland flights, once a A32N replaces is of their A319 in 2019. I just went to FAE from the US via IAD-KEF, then RKV-FAE. It wasn’t bad, but the main problem was that RKV-FAE only operates 2-3 days per week, and it’s poorly aligned with US flight arrival times. Atlantic Airways could greatly facilitate US tourism by simply increasing the frequency of flights to Iceland and better coordinating them with Icelandair flights from the US. They will come to New York eventually. They have quite a bit of slack in their fleet, only the CPH route is taking a whole aircraft to operate. Atlantic Airways have done Gran Canaria, Rome and Chania on Crete for years now on the A320ceo, with holiday makers from the Faroe Islands. The LPA route is 5 hours 15 minuttes, the New York route wouldn’t be that much longer to make it unfesiable, and there would be a market ( albeit a small one ) for pax from the Faroe Islands aswell. The Faroe Islands are today what Iceland was 10 years ago, when I was there for the first time. It is beautiful but it doesn’t have all the natural beauty that Iceland has. You know what else it doesn’t have? Yep…all the tourists. For now. So even if you don’t have all the beauty and variety of landscapes that Iceland has, it’s much more pleasant and fun to visit. If you think Iceland has an overcrowding problem then you haven’t explored enough. Head east past Höfn or north past Akureyri.